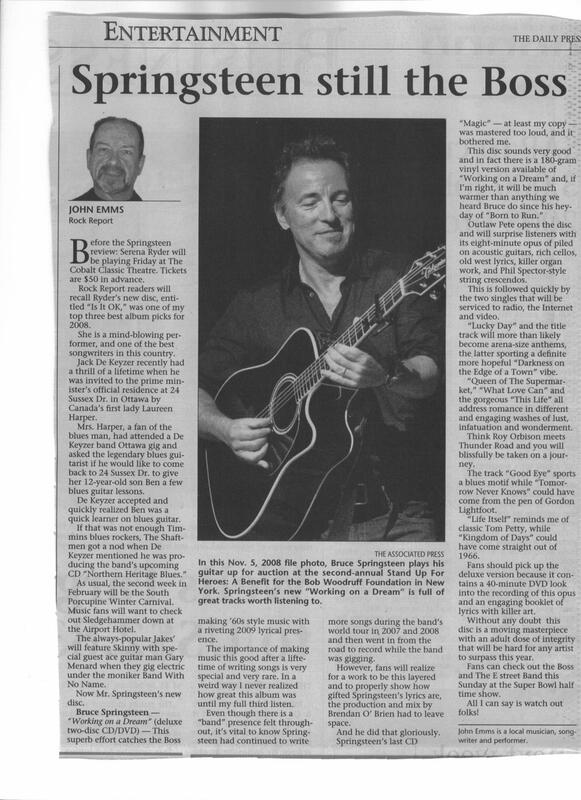 I have seen Bruce and the E Street Band in concert. I own three of the Boss’s dvd’s. 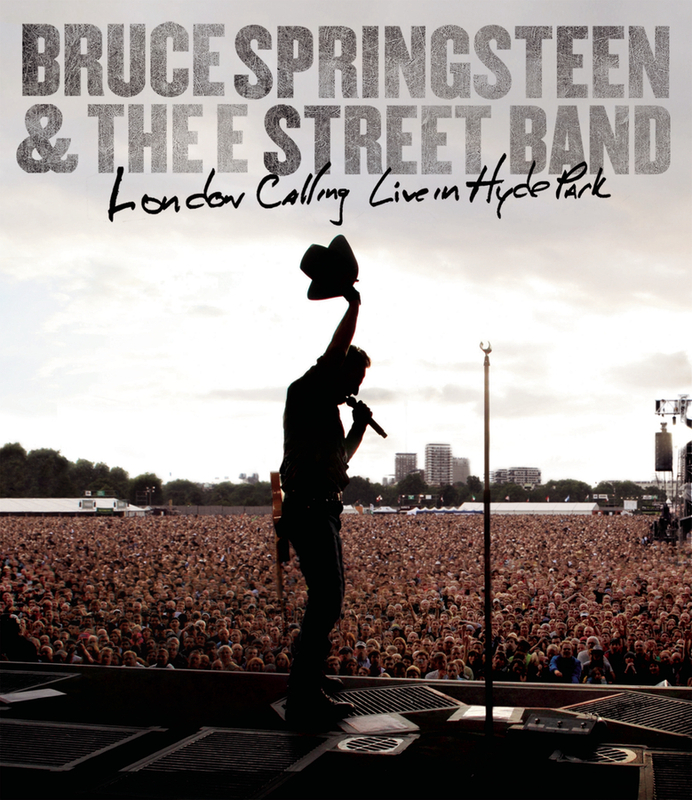 BUT FOLKS this dvd concert from Hyde Park outclasses everything I have ever saw him and the band do. Part of it maybe is the fact, that for 3 hours it’s rock n roll of the highest order. There are some ballads, but not many. HOWEVER, the real reason hits you over the head in a bigger way. SPRINGSTEEN and The E Street Band live and breathe the dynamics of the songs on stage like Religion. This show is a living breathing toure de force of rock n” roll. Springsteen sweat drenched at 60 years old delivering a set with so much integrity it would shame any musician. 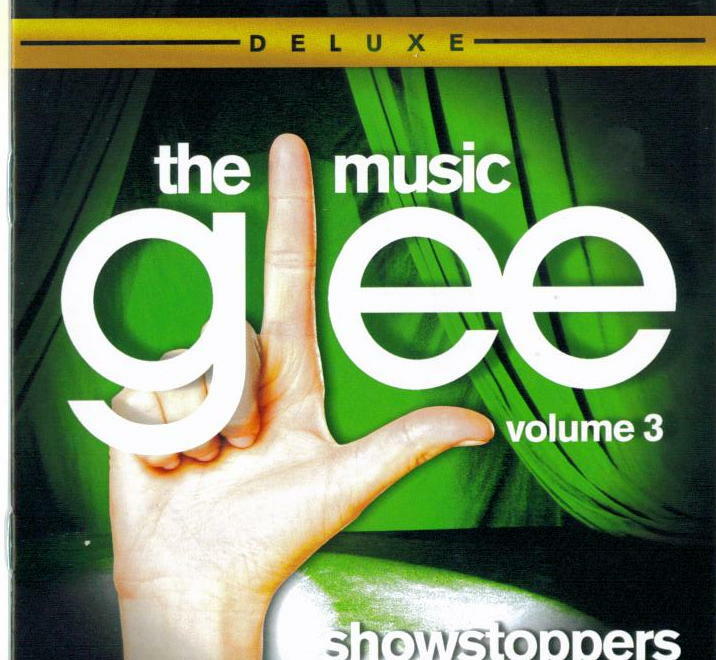 THIS DVD makes me glad I’m a songwritier and musician. It also makes me realize that myself and my friends and fellow musicians do not respect our musical gift enough. It does not matter that this concert is in front of 60,000 or whatever people, on a huge stage, with great gear. IT’S THE CONNECTION with the fans. It’s electric and undeniable. On a scale of 10 it’s an 11. Everything the Boss puts out, the fans give back. This rarely happens and if it does the band rarely reaches down to it’s core to deliver this kind of performance. I could go into the songlist but it is simply not necessary. If you have never experienced The Boss and The E street Band, or even if you have saw him in concert, this is without a doubt your front row seat to an amazing show. QUITE SIMPLY..you are there on stage. Check out his various links on this page. PICK UP THE NEW HELIX CD. FOLKS. IT’S A SHORT (32 minutes) EXPLOSIVE SLICE OF HARD MELODIC ROCK. MORE HELIX live on this week’s June 17th show..8.p.m. Timmins fans will be as the classic Helix song/video states Running Wild In the 21st Century when Canuck vintage hard rockers Helix rip into The Vic Friday night July 2. What’s even bigger news is the band’s new cd Vagabond Bones is a hit right out of the box. In fact, personally I see this release as an updated but true to their hard driving melodic sound. What could top that news? The original Helix lineup will be there. Yes you heard right! Lead singer Brian Vollmer, drummer Fritz Hines, lead guitarist Brent Doerner and bass player Daryl Gray will indeed blow the doors off The Vic. As most rock fans know guitarist/songwriter Paul Hackman died in 1992 in a vehicle accident when the band’s van left the road and rolled down a 40 foot embankment 60 miles from Kamloops British Columbia. On this tour subbing in as co-lead guitarist is Kaleb Duck who also works with Canuck progressive heavy metal rockers Bravura. 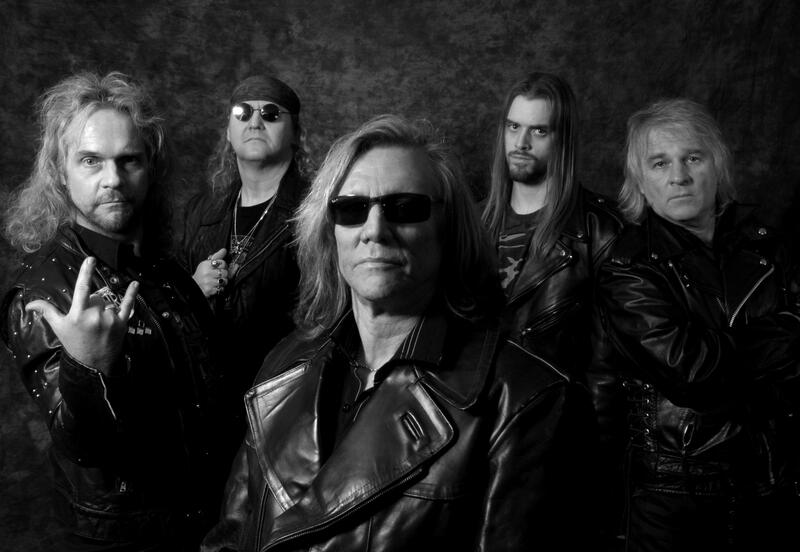 Helix was a huge force in Canadian hard rock/metal duirng the 80’s. The band toured with Alice Cooper, Whitesnake, Motorhead, Quiet Riot and many others. In fact at one gig opening for Heart in Kentucky a stranger jumped up on the stage to jam with Helix guitarist Doerner. It was at this time the band realized it was none other than Eddie Van Halen. Vollmer-Thanks John, we just released Monday Morning Meltdown and Make Em Dance and the youtube numbers are fantastic. Emms-Is classic rock radio playing your new songs? Vollmer-They are in some markets. What’s upsetting is a lot of classic rock stations use the CRTC ruling about Canadian content and play a lot of our older classic songs, and other stuff from April Wine,Trooper and others. I mean do we need to hear We’re Here For A Good Time every day. If new music by classic acts is presented in the right form and I hear this on internet radio broadcasts then it will really make an impression. Vollmer-Thank you, I would love to check out your radio show. Emms-I notice your new cd is being distributed by Universal Music.This is pretty cool. Vollmer-(laughing) Well I do all the work. Did you notice I called you and set up this interview. I take care of the Helix website. (it’s very cool site readers) and generally I’m hands on in every aspect of the band. Emms-Can you make more money as a business and artist this way? Vollmer-Well in the old days we were signed directly with Capital Records in the US and granted they broke us. We ended up touring in all parts of the world with the world’s biggest names. On the other had if we made an album in those days and it cost 40,000 dollars, they would give Helix 3 cents a song at 10 songs so it was impossible to pay off of a debt of 40,000 bucks. And that was just for the recording. These days we can make a cd for $15,000 dollars and sell the cd for 14 dollars. That is a litttle better. Emms-Anvil had a tremendous success with their movie The Story of Anvil. 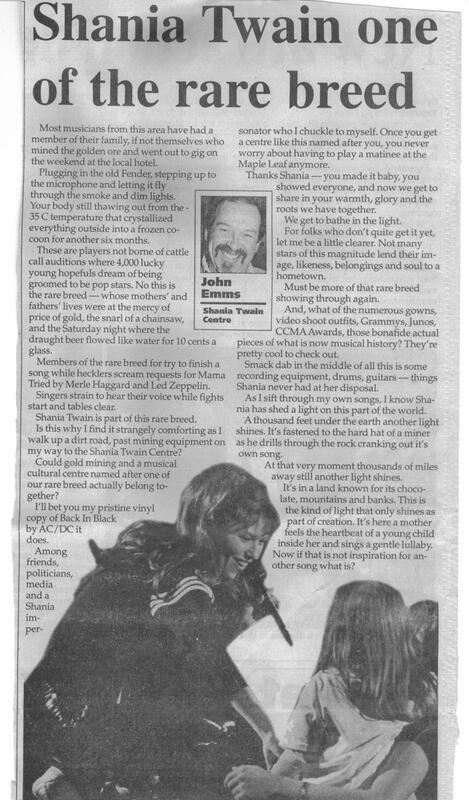 It was reviewed 4 stars in Rolling Stone Magazine, The New York Times etc. Heck the story of Helix would make an intersesting documentary. Your history is exhausting and long. Vollmer-Actually we would like to get a t.v. show happening. I can’t tell you much more now John, but it would revolve possibly built around characters in a show where I could describe and host on touring, recording etc.And it might be intersesting for younger artists. I’m just thinking about it now, so I can’t say anymore. Emms-Your book “Gimme an R” how did that do? Vollmer-I made all my money back and then some, and fans who read the book said they totally enjoyed hearing about our exploits. More important it created a band legacy. Vollmer-Ronnie was a true gentlemen much like Alice Cooper. He took the time to converse with you, and made you feel important. It’s very sad. Emms-What can we expect at The Vic on July 2nd? I will be reviewing the new Bruce Springsteen & The E Street Band Live from The Agora 1978 in Cleveland. john emms is a PUBLISHED MUSIC JOURNALIST AND RADIO SHOW HOST John has 20 years experience working with all major labels. JOHN is also the lead vocalist/songwriter with THE SHAFTMEN.. THE MUSIC FROM this T.V. show is so bad..yet it sells like crazy. Wake up America, Wake Up Canada..ARE U TONE DEAF????? Plain and simple it’s a disgrace when this stuff tops the BILLBOARD CHARTS..
HELL when you have covers of actual good songs this awful..it’s ridiculous. I played this stuff for my grandson..then played him the originals. Thank God he could hear the difference..
WALKER is the perfect blues/roots vehicle for any music label (in this case Stony Plain Records) because he offers listeners such a wide pallete of dazzling song options. Produced expertly by the legendary Duke Robillard Walker has no problem walking the line between the roots of blues with the healthy infusion of rock or soul. Just check out the mule kick of I’ve Been Down, the whiplash stroll of I’m Tide and cross tie soul of Black Widow Spider. There is a sense of urgency about this album that jumps out of your speakers. The hard driving If There’s A Heaven with the earthy tones of Kevin Eubanks and the spellbinding slow minor chord blues of Hallways with it’s gorgeous piano and guitar solo breaks reach far further into the passion of where many artists would even would dare to go. That is commitment folks! The album ends with the wah wah rip of Big Fine Woman and the acoustic Delta-ish vibe of Send You Back.